Nothing makes breakfast complete like a nice batch of perfectly-toasted bread. When it comes to toasting bread, you can never go wrong with getting a reliable toaster. Getting yourself a nice toaster is no hard feat, but the real question here is what kind of toaster should you get? If you ask me, multiple slotted toasters are well past their prime. Since not all types of bread can fit in the small slots that often come with typical two or four slot toasters, the best option are those long slot toasters that can fit almost any type of sliced bread. With a long slot toaster at your disposal, you will be able to perfectly toast long slices of baguettes or two slices of normal sliced bread at the same time. Long slot toasters also look a lot more attractive than multiple slot toasters. They come in striking designs that you won’t be ashamed to display in your kitchen. If you want to switch to a better toaster that not only looks great but offers more versatility as well, I encourage you to take a look at this short buying guide for the best long slot toaster to get. Find the best ones based on reliability, durability, functionality and ease of usage. Before we get into the list of the best long slot toasters you can find in the market, let me first discuss the different benefits that you will be able to enjoy if you do decide to get a long slot toaster for your home. One major benefit of owning a long slot toaster is added versatility. With normal two or four slot toasters, you will only be able to toast normal slices of loaf bread. With a nice long slot toaster at your disposal, you will be able to toast different kinds of bread because of its lengthier slot. With a long slot toaster in your kitchen, you will be able to perfectly toast lengthy slices of baguettes, focaccia bread, and more.Another great benefit of a long slot toaster is that it’s efficient. If you were to prepare lengthy slices of toast for yourself or for your guests, you will no longer have to exert time and effort into slicing your bread loaves just to meet the standard size for your toaster’s slots. A long slot toaster isn’t only known for its versatility. It can also be great for toasting other ingredients such as oversized waffles, tortillas, and even a piece of Texas toast. As for the overall design, long slot toasters tend to look more attractive because of its sleek design. A feature that can further be emphasized with a stainless steel or chrome finish. Some brands of long slot toasters may even allow you to toast thick grilled sandwiches like paninis, cheese biscuits, grilled cheese, and egg biscuits. So how exactly do you find the best long slot toaster for your home? Though toasters may seem like fairly simple kitchen appliances, you might be surprised as to how many features you will need to look out for in order to get your money’s worth. The ideal long slot toaster is one that comes with a highly attractive and functional design. Try to look for a long slot toaster that comes with a stainless steel or chrome finish to avoid having difficulties with fitting it in with the rest of your kitchen appliances. As for ergonomics, try to choose a long slot toaster that comes with buttons that are easy to press, labels that are easy enough to read, and a cord that is long enough to reach your power outlets. When it comes to choosing a long slot toaster, try to go with one that is made with highly durable materials. This may mean going for a long slot toaster that has minimal plastic parts. However, this doesn’t mean you should disregard toasters that are made with plastic. Just make sure that every bit of the toaster you are getting comes with parts that don’t easily break off or chip away. This feature would, of course, depend on how much bread or ingredients you plan to toast. If you were to use this kitchen appliance for your personal needs, then I guess it would be safe to go with a long slot toaster with minimal slots. If you were to use this toaster for commercial use or to prepare food for a large family or group, then I highly suggest going with a long slot toaster that comes with multiple slots. Try to go with a toaster that you know you will be able to enjoy. By this, I mean choosing a toaster with a set of features that will not get you overwhelmed during each use. You may be tempted to get a long slot toaster that comes with all the bells and whistles, but that shouldn’t be the case. You should instead go with a long slot toaster that offers a set of features that fit your needs and preferences. Doing so will not only cause you to get a product that’s not overwhelming to use, it can save you a couple of bucks as well. Using a toaster is usually a piece of cake, but more often than not, a lot of people commit simple mistakes. Some mistakes you should avoid when it comes to using toasters is placing a soggy ingredient inside the slots. Doing so will only lead to unfavorable outcomes such as a piece of bread with an unpleasing consistency, and corroded metal parts. Instead, try to place completely dry ingredients in your toaster for best results. If you were to make a grilled cheese sandwich or any kind of sandwich with fillings, just make sure that the parts of the sandwich you are placing in your toaster is dry, and that all the fillings are contained within the sandwich itself. Another thing you should avoid doing is using metal parts to adjust the food placed inside your toaster. Doing so may result to electrocution. So as a safety measure, try to use plastic or silicone utensils instead whenever you need to adjust your food in the toaster. You can see our detailed review about each product below. This Cuisinart toaster comes with extra-large slots that you can use to perfectly toast all kinds of bread including artisan breads. You can also use it to toast large waffles and sandwiches with thick fillings. What I like about this toaster is that it comes with a stylish and sleek-looking chrome exterior design. Even its hi-lift lever comes with a chrome finish. This toaster also comes with self-centering bread slots that wouldn’t require you to make any adjustments once you place your food inside it. It also comes with different toaster functions such as 6 shade settings, cancel, defrost, reheat, bagel, and toast. 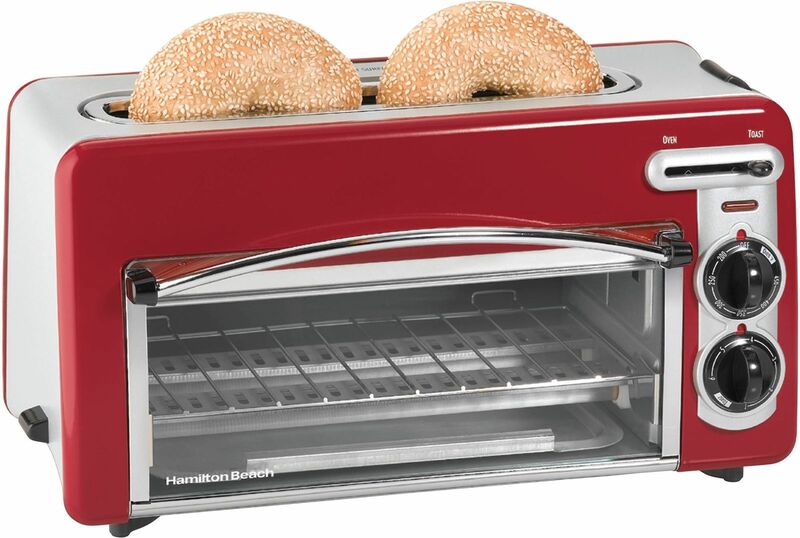 This Hamilton beach long slot toaster is probably one of the fastest and most energy efficient one in this list. It can toast your bread 24% faster, reheat food 28% faster, and can save you energy by consuming 73% less power. This toaster also comes with a compact oven. This means that you can efficiently toast bread as you toast, broil, or even bake food inside its compact ﻿﻿oven. Talk about versatility and capacity, right? What I love about this machine is that its slots allow for 1.5-inch thick ingredients, making it easy to create grilled cheeses, paninis, and other kinds of sandwiches with semi-thick fillings. This Breville long slot toaster is the ideal choice for toasting multiple pieces of lengthy bread slices at the same time. It comes with multiple long slots that can accommodate two lengthy sizes of bread or four short sizes of bread. 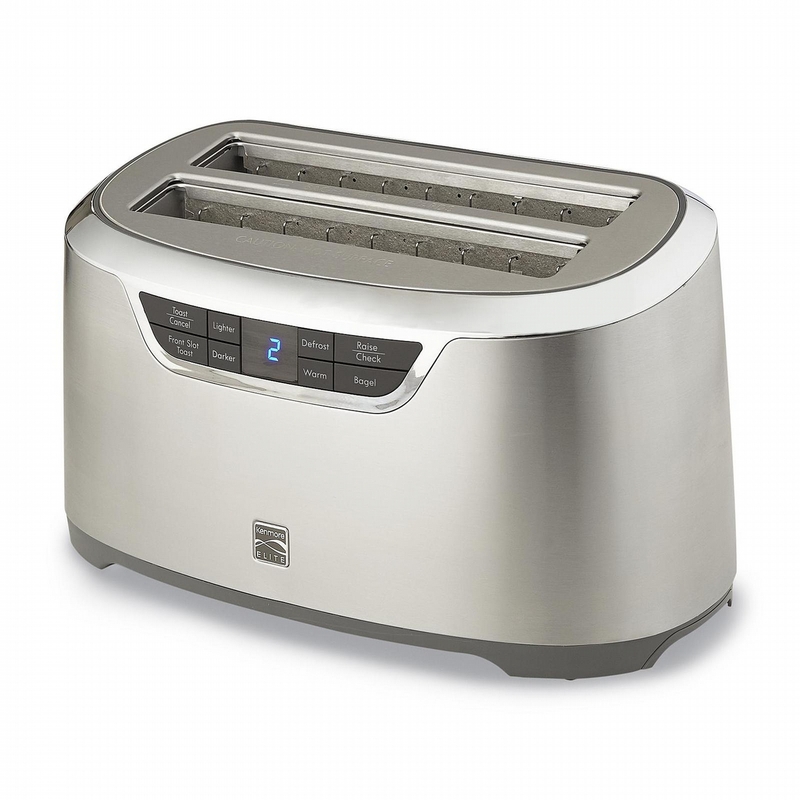 What makes this toaster great is that despite its increased capacity, it still boasts a sleek and attractive design. It even comes with a bright LED display that you can rely on for the toasting progress. It can even alert you by sound that you can adjust to mute, low, or high. Has some hot spots that can result in uneven heating. This affordable long slot toaster is a good choice for every household. It doesn’t just have longer slots to ensure you can toast more breads in one go or toast longer kinds of breads, it also has a thickness adjustment feature. It automatically adjusts to the size of your bread so that you can get even toasting results. You can also choose from 7 different toast levels. If you prefer your toast on the crispier side, set it up to a higher toast level. This is a more modern long slot toaster that features an LED countdown timer display. You can see how much time is left until your toast is done. The slots are long enough for 4 slices or 2 longer slices of bread. It also boasts of 9 different toast settings, to ensure that you get just the right level of crispiness in your bread. If you are looking for something with a good quality but isn’t too expensive, get the Cuisinart CPT-2400 The Bakery Artisan Bread Toaster. The price is just right for something that can last you for a long time. It can be a good tool for home cooks who need to toast bread for their family every morning. Those people with limited counter space should try the Hamilton Beach 22703 Toastation Toaster and Oven. It is a toaster and an oven, so you don’t need to get these appliances separately, thereby saving you a lot of space. 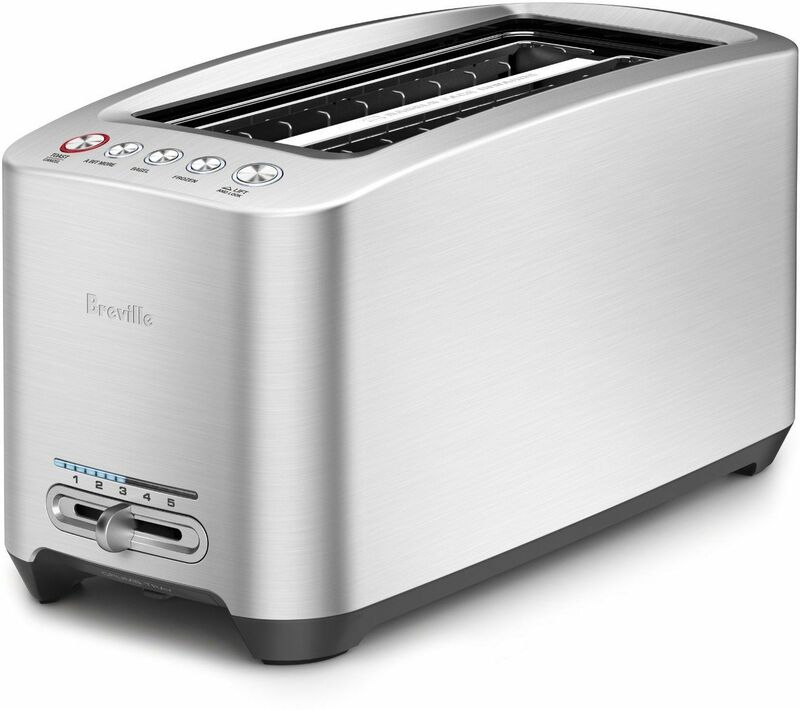 If design is an issue, you will be happy with the Breville BTA830XL Die Cast 4-Slice Long Slot Smart Toaster. It is one of the sleekest-looking toasters out there and you will be proud to display it on your kitchen countertops. 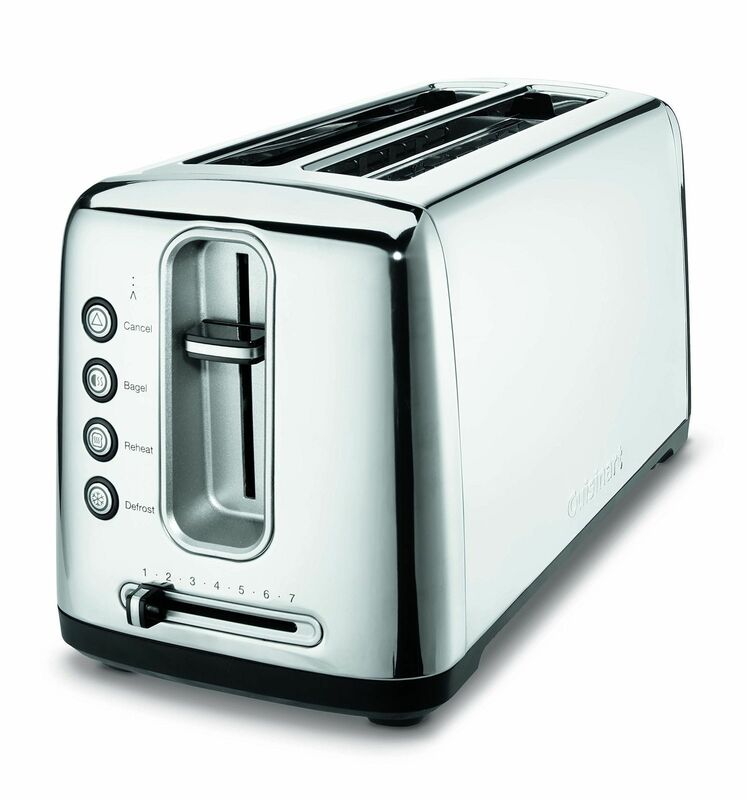 But aside from a great design, it also offers a lot of modern features that you can’t find in other basic toasters. Looking for something more affordable but won’t disappoint you? 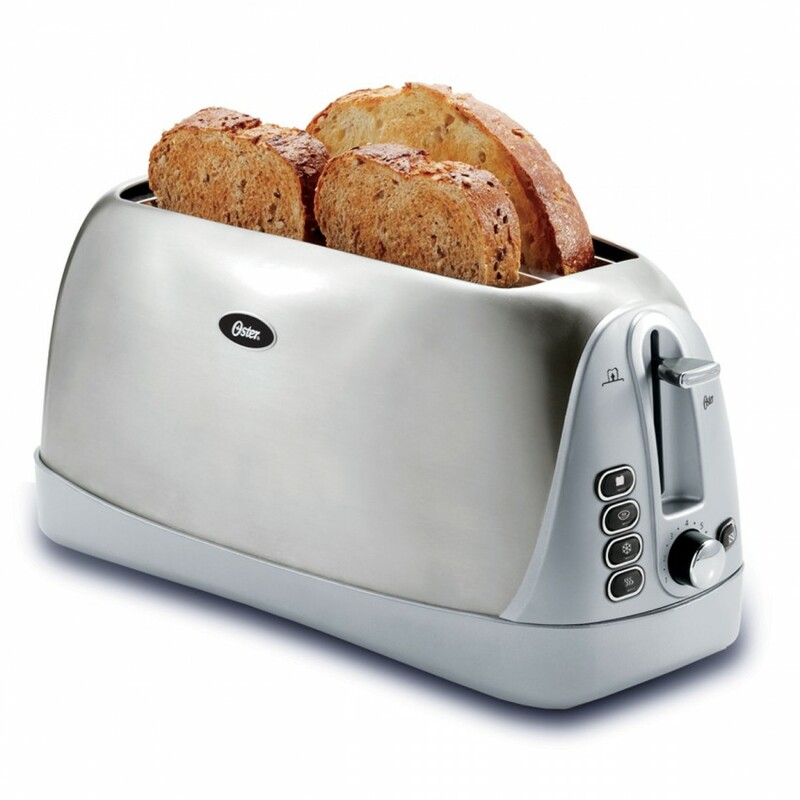 The Oster Long Slot 4-Slice Toaster is a good choice. It won’t break the bank, but it offers a lot of nice features that ensure you can get those breads toasted up. Do you want something that looks more modern? Get the Kenmore Elite 76774 4-Slice Auto-Lift Long Slot Toaster instead. It has an LED display that makes operating this appliance easier. We've taken all the different factors into account and decided our favorite choice as the best long slot toaster is the Oster for its affordability, convenience and versatility. Don’t forget to visit our homepage to learn more tips on how to buy the best kitchen and cooking tools and appliances. Check out what products we highly recommend and read our buying guide so you can make a better buying decision.